I'm new here, I looked up and tried to find an answer to my question, but could find one... Sorry if this has been answered already! So now after 3 or 4 days, the changes are appearing on Graphhopper - great! Any idea why? What should I do for this to work out properly? Thanks! For future reference, as of today the routing is working on Graphopper! I just takes a little longer. Welcome! :-) See also https://help.openstreetmap.org/questions/53722/when-do-directions-get-updated-after-changes-are-made-to-the-maps and https://help.openstreetmap.org/tags/update/?sort=mostvoted for a bit more general answer to your question. I checked your edits and found nothing wrong. I used the JOSM Validator to check the whole area and there were a few warnings that should NOT influence the routing there. I corrected this warning for you. The hiking path crosses a little stream on several places. I did not correct this because I don't know if there is a bridge or a place where you can wade through the stream. I'm in The Netherlands and I use BaseCamp for routing. I don't have a map for Canada and could not find a recent enough Garmin extract. I downloaded a map in OsmAnd which I use for navigating on my Samsung Galaxy. OsmAnd also does not route there. The OsmAnd map is also not recent enough. I used QMapShack with the recent standard OpenstreetMap as a backgroud. I build a Database for Routino from the above geofabrik download and made a hiking route in QMapshack. 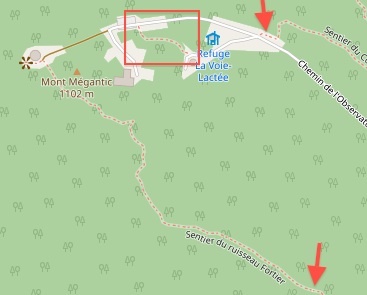 So, you can use http://download.geofabrik.de/ Routino and QMapShack to make a hiking route from your latest edits or just wait till Graphopper gets a new update. Not sure I want to get into serious map editing right now, it's mostly that I find it very annoying when trying to get navigation stats (distance, elevation gain, etc.) and there are gaps in trails like this!! Thanks for your answer and for taking the time to look at it :) Next time I go there I'll make sure to take note of which stream crossing has/doesn't have a bridge and I'll come back to fix that. Using the new data for display can happen more quickly than using the same data for routing and navigation. I suggest you see if Graphhopper indicates anywhere how often they update their routing database from OSM. For foot routing there shouldn't be any difference between between "path" and "footway". I personally use "footway" for wide smooth, generally hard surfaced, ways as found in suburban and urban areas. And I use "path" for the typically more narrow and unsurfaced ways that I hike on in the hills and mountains. My division between the two is generally based on deciding if a parent could push a baby stroller along the way, if so then footway if not then path. Thanks stf, I though updating display and routing/navigation was the same. Here is what they say in the FAQ: "How long does it take after I updated the data on OpenStreetMap.org? A change of the data at openstreetmap.org will be considered in our APIs usually after 2 days and at least every week. Except for the Geocoding API: the default provider can take up to 7 weeks and the nominatim provider should be updated within one week." Regarding path vs footway, I understand what you are saying, but apparently there is a difference. Before I made the change, there were no line/road/trail showing at all on the map in the red box area I outlined, but there was a line tagged "path" that I could see in the editor. So I looked in the editor to find the difference between the other trails that I could see and the line that I couldn't see, and the only difference was the "highway" tag, which is why I changed it's value from "path" to "footway". And now, after my change, the trail is showing, so I guess there is a difference, but I can't tell more. The path was only added a few days ago (about a day before you edited it), so the reason you couldn't see it on the map is probably just that the tiles hadn't re-rendered yet. Usually the tiles at the higher zooms on the "Standard" rendering will update after about a minute, but sometimes there are delays or your browser shows a cached version. Given a bit more time, the highway=path would have shown. Thanks alester, I hadn't seen that it was a brand new path! Stf, just found that according to default access restriction, a "path" and a "footway" are not the same. A footway excludes bicycles, horses and moped by default.